No matter which source control tool you’re using, sooner or later you’ll encounter a merge conflict. When this happens, a decent graphical merge tool is a must-have. 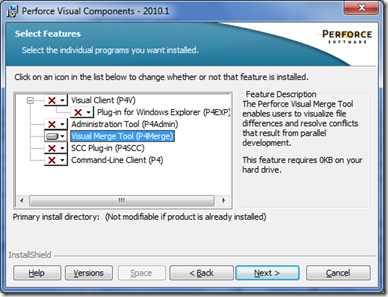 There are two different types of merge tools. Two-way merge tools show you your version of the file and the other person’s version of the file side by side. 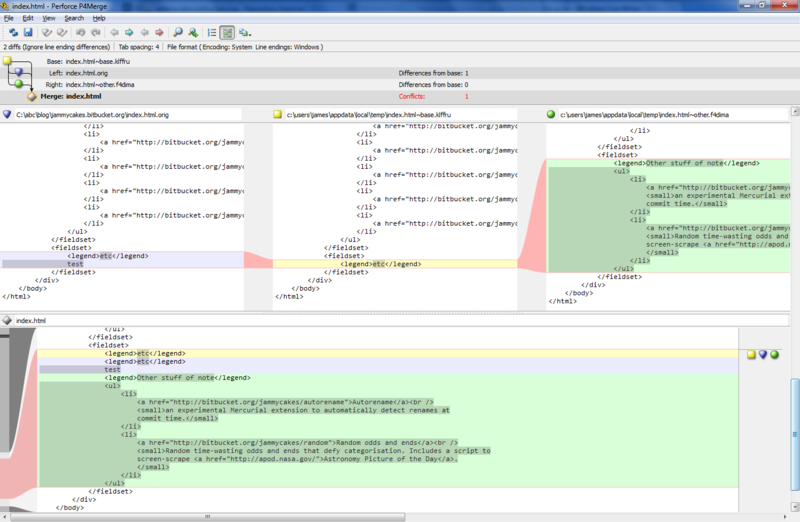 Three-way merge tools also show you the original file in the middle. This helps clear up a lot of confusion, since you can see what the original file looked like before anyone did anything to it. So far, I’ve been using TortoiseMerge as my merge tool of choice, since it comes with TortoiseSVN, it’s familiar, it’s reasonably usable, and it is not too ugly. The only downside is that it’s two-way, rather than three-way. TortoiseHg gives you kdiff3 by default instead, which is a three-way merge tool, but it’s an absolute eyesore and its usability leaves a lot to be desired. Up to now, I’ve always switched it out in favour of TortoiseMerge. 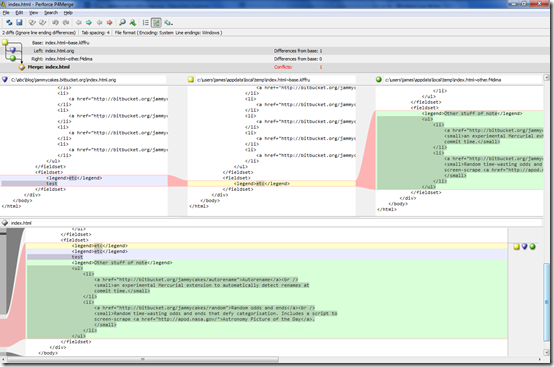 Recently I came across the Perforce merge tool P4Merge (hat tip: Novaleaf Game Studios) and I must say that I’m impressed. It gives a very clear, intuitive view of what’s changed, with a text editor underneath that lets you resolve the conflicts easily. The icons to the right hand side of the text editor allow you to select which version you want to cherry pick. Oh, and visually, it looks fantastic. 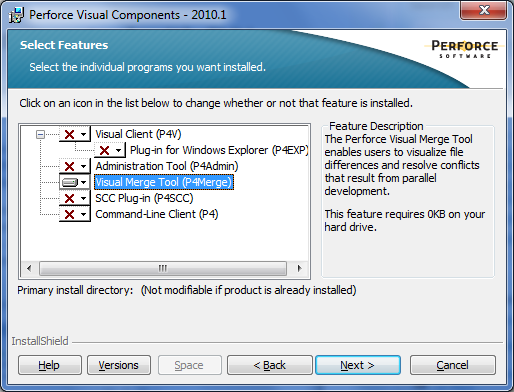 P4Merge comes with the Perforce client tools which are a free download: if you’re not using Perforce itself for source control, select only the merge tool on the installation wizard and deselect everything else. Once you’ve installed P4Merge, TortoiseHg will automatically detect it and list it as an option in the TortoiseHg configuration dialog or merge wizard. If you’re using Subversion or Git with their respective Tortoises, you need to specify the command line in the options dialog: Using a cool merge tool with SVN or GIT tells you how. Team Foundation Server is somewhat more complicated, but still doable: Using P4Merge with Visual Studio 2008 and TFS explains how to tackle it. The only downside next to TortoiseMerge is that the option to cherry-pick changes only works on the block level, rather than on a line-by-line basis. However, since the resolution panel at the bottom is of course a free-form text editor, you can easily copy and paste as necessary, so this is no big deal. I think I’ll be using it as my merge tool of choice from now on. Posted at 08:00 on 4 October 2010.